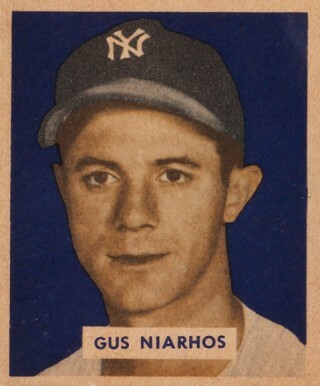 When the Yankees signed catcher, Gus Niarhos to his first contract, Hall-of-Famer Bill Dickey was still starting behind the plate for the parent club. Nine years later, when the Yankees placed the first Greek-American ever to wear pinstripes and play in a World Series on waivers, Hall-of-Famer Yogi Berra was the team’s starting catcher. As Niarhos explained years later, when asked about his career as a Yankee, “That was a tough organization if you were a catcher.” It sure was. Niarhos was born and raised in Birmingham, Alabama, where he was a three-sport star as a high school athlete. He was actually enrolled at Auburn University on a football scholarship when the Yanks signed him and sent him to their Akron farm club. When WWII broke out, Niarhos joined the Navy and served his country for the next four years. He got his first chance to play in the Bronx in 1946, when he was called up in June of that year, after Bill Dickey replaced Joe McCarthy as Yankee skipper. Though Dickey continued to catch occasionally after becoming manager , it was Niarhos who served as Aaron Robinson’s primary back-up during the second half of that season. Solid defensively, Niarhos was pretty much a singles-hitter with the stick and he never hit a home run during his days with New York. After spending the entire 1947 season back in the minors, he shared the Yankees’ starting catching responsibilities with Yogi Berra in ’48, averaging a decent .268 but producing just 19 RBI’s. Berra became the Yankees’ full time receiver the following season with Niarhos backing him up and since Yogi could catch 140 games a year in his prime, New York suddenly found itself with a glut of backup catching talent and released Niarhos. He landed on his feet with the Chicago White Sox, where he hit a career high .324 backing up Phil Masi during the ’50 season. He hit his first and only big league home run the following year against his former team, when he connected off of Yankee reliever Bob Kuzava. He later played for both the Red Sox and the Phillies. He finally hung up his catcher’s mitt for good after the ’57 season and became a minor league manager and coach in the A’s organization. He passed away in 2004 at the age of 84. Niarhos shares his birthday with this Hall-of-Fame Yankee second baseman, this former Yankee coach , this Cuban defector and this former Yankee outfielder. Larry Bowa was not blessed with a huge amount of natural ability. The reasons why he was able to play shortstop in the big leagues for sixteen seasons, win two Gold Gloves and become a five-time All Star were an incredible work ethic and a tremendous amount of passion for the game. He was also a quick study. He realized early on that knowledge was power on a baseball field so he learned everything he possibly could by observing the opposition in every aspect of every game. In 2006, he brought this same work ethic, passion and hunger for knowledge to the Yankees when he accepted an offer to coach third base and infield defense for Joe Torre. The thing I loved most about Bowa during his two seasons in New York’s third base coaching box, was his loyalty to Torre and the Yankee players and his obvious intensity. He refused to permit Yankee runners to lose their focus on the base paths. Pity the poor pinstriper who ignored or missed a Bowa delivered signal of any kind. Its been well established that it was Bowa who got a young Robbie Cano to improve his level of concentration whenever he was on the field. The naturally gifted second baseman flourished offensively and defensively under Bowa’s strict tutelage. Alex Rodriguez told reporters that Bowa was the best in the business and I’ve read that Jeter loved this guy too. One of the reasons I hated to see Joe Torre leave as Yankee manager after the 2007 season was that he took Bowa with him to Los Angeles. Bowa admired the way Torre managed a ball club and handled players. Once a manager himself, Bowa had a tough time controlling his intensity and some of his players rebelled against his high pressure approach. Torre’s calm demeanor as skipper complemented Bowa’s brash coaching style and made the relationship tick. When he left for the Dodger job, the Yankee players instantly missed his motivational mentoring and though I respect Robbie Thompson, I wish Bowa was still stationed in New York’s third base coaching box. Bowa shares his December 6th birthday with this Hall-of-Fame Yankee second baseman, this Cuban defector who became a Yankee starting pitcher, this former Yankee catcher and this former Yankee DH. Long time Yankee fans look back at the 1980s as the era of bad free agent signings for the franchise. After taking brilliant advantage of the Supreme Court’s striking down of baseball’s reserve clause in the 1970s, the Yankee front office led by the impetuous and impatient George Steinbrenner, evolved into one of the worst judges of free agent talent in all of baseball. They’d sign guys with games that did not complement the Yankee lineups they were expected to join or were not conducive to the dimensions of the old Yankee Stadium. It was these poor fits that used to upset me most. They’d give lots of bucks to players who performed well on their old teams and in their old ballparks but once they put on the pinstripes, it seemed as if they lost half their skills and most of their confidence. Today’s Pinstripe Birthday celebrant was a classic example. Gary Ward had been in the big leagues for eight seasons when the Yankees signed him to a three-year, two million dollar free agent contract on the day before Christmas, in 1986. He had averaged right around .290 with both Minnesota and Texas and could be counted on to hit between 15-to-20 home runs and drive in close to 80 runs every season. The Yankees were depending on the burly native of L.A. to produce similar numbers in pinstripes and take up a significant chunk of the offensive slack and one of the two outfield holes created with the departures of both Ricky Henderson and Dan Pasqua. During the first half of the 1987 season it looked as if the Ward signing was a stroke of genius, as he got off to a torrid start at the plate. Even though he slumped badly in the second half of the season, he still managed to produce 16 home runs and 78 RBIs during his initial year as a Yankee but as his slump worsened, his average plummeted into the .240s. He was unfortunately in the process of discovering how the spacious left field of Yankee Stadium acted as a burial ground for well-hit balls off the bats of right-handed hitters. In 1988, things got much worse for Ward. He averaged just .225, hit only four home runs and drove in the putrid total of just 24 runs. 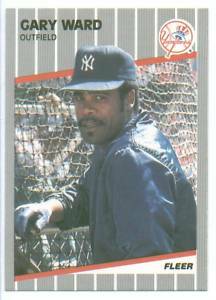 By the second half of that season he had become a part-time player and the Yankees ended up giving him his outright release during the first month of the 1989 regular season. The Tigers picked him up and he spent his last two big league seasons in Motown, as Detroit’s fourth outfielder. Gary shares his December 6th birthday with this Hall-of-Fame Yankee second baseman, this former Yankee coach, this former Yankee catcher and this Cuban defector who became a Yankee starting pitcher. 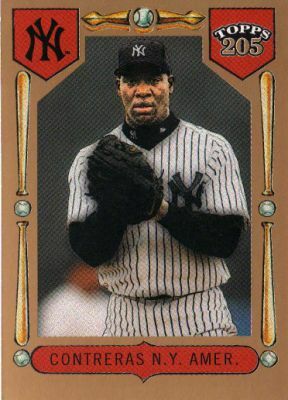 The real problem the Yankees had with pitcher Jose Contreras was that they had to pay him $32 million to convince him not to sign with the Red Sox, after the big right-hander defected from Castro’s Cuba in October of 2002. New York’s generosity in pursuit of Contreras evoked the famous statement from Red Sox owner, Larry Lucchino in which he labeled his AL Eastern Division arch rivals, the “Evil Empire.” So the expectations for this guy were huge within the Yankee front office and their enthusiastic and self congratulatory gushing over his signing caused Yankee fans like me to believe Contreras would pitch even better in pinstripes than his fellow Cuban defector, Orlando Hernandez had done a few years earlier. So when Contreras did not pitch as well as El Duque did, especially during his second (2004) season with New York, the fans would boo and the Yankee front office would sweat nervously. Joe Torre shuffled him between the starting rotation and the bullpen in an effort to find his comfort zone but that never really happened. Having written all that, it is important to note that Contreras was not exactly a bust in pinstripes. During his season and a half in New York he compiled a 15-7 record, which included a 6-1 record as a starter in his rookie season when he also posted an ERA of 3.30. That was not enough return for Steinbrenner et al on their $32 million investment. The front office became intent on dumping Contreras and as much of his remaining contract as possible and ended up sending him and a bundle of cash to the White Sox for starter Esteban Loaiza at the 2004 All Star break. The deal looked good on paper for New York because Loaiza had won 21 games for Chicago the season before and was 9-5 thus far in 2004 at the time of the trade. But he failed miserably as a Yankee while Contreras finally got his big league bearings in the Windy City and became a key starter in the rotation that led the White Sox to the 2005 World Championship. Contreras was born on December 6, 1971 in La Martinas, Cuba. He pitched in the Phillie bullpen last season. Today is also the birthday of the Yankee nicknamed “Poosh em Up,” this former Yankee coach and this former Yankee outfielder. If I was given the choice of a back seat to sit in on a historical car ride, I’d have a tough time not selecting the 1936 cross-country trip taken by three members of the New York Yankees. The Yankee front office had just purchased the contract of a young Pacific Coast League ballplayer named Joe DiMaggio. The kid lived in San Francisco as did the two players who composed New York’s starting middle infield back then, shortstop Frankie Crosetti and today’s birthday celebrant, second baseman, Tony “Poosh em Up” Lazzeri. The Yankee front office had arranged to have the two veterans pick up DiMaggio at his home and drive him the three thousand or so miles to St. Petersburg, FL, where the Yankees conducted Spring training. 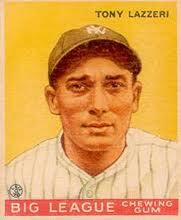 Lazzeri is still considered to be by many, the greatest second baseman in Yankee franchise history. Born in 1903 in San Francisco, his first year in the Bronx was 1926 and he started fast by belting 18 home runs and driving in 114 runs. He would drive in 100 or more runs seven different times and he finished his fourteen-season career with a .292 lifetime batting average and 1,191 RBI’s. Like Crosetti and DiMaggio, Lazzeri was an Italian-American and before the Yankee Clipper joined him in New York, he had become the number one sports hero of the 1 million plus Italian-Americans who were living in the Big Apple. Perhaps the most amazing thing about his accomplishments on the ball field was the fact that he achieved them while being afflicted with epilepsy, at a time when the disease was poorly treated and very misunderstood. He played in six World Series as a Yankee and won five rings. He was unceremoniously dumped by New York after hitting a career-low .244, in 1937. He signed with the Cubs in 38 and made it back to the World Series for a seventh time as a part-time player for Chicago. In a bittersweet moment for Tony, the Cubbies lost that Fall Classic to the Yankees. After trying to hang on with Brooklyn and then the New York Giants, Lazzeri retired after the 1939 season. He then became a Minor League Manager for a few years before buying a tavern in his native San Francisco. In 1946, Lazzeri’s wife came home from a vacation to find her husband dead. He apparently fell down the stairs in their home and was killed when his head banged against the bannister. The Baseball Hall of Fame Veterans Committee put Tony’s plaque in Cooperstown, in 1991. Lazzeri shares his December 6th birthday with this Cuban defector who became a Yankee starting pitcher, this former Yankee coach, this former Yankee catcher and also with this former Yankee outfielder.